Row 1: ch 52, sc in second ch from hook, *ch 2, skip 1 ch, sc in next ch, repeat from * 24 more times, finish off. Weave the satin ribbon through the spaces in the crocheted headband, leaving an equal length of ribbon at each end for tying. Tie a knot to secure the ribbon in place on each end of the crocheted lace. Cut ribbon ends at an angle to prevent fraying, or dip in glue to seal the ends. 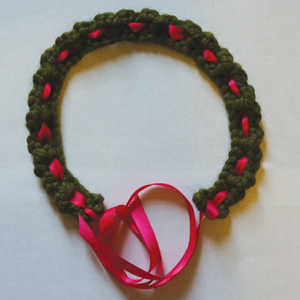 This entry was posted on Tuesday, January 29th, 2013 at 12:00 AM by Emilee Gettle	and is filed under Free Crochet Patterns. You can follow any responses to this entry through the RSS 2.0 feed. You can skip to the end and leave a response. Pinging is currently not allowed. Love the headband! I want to do this for myself and daughter. Thanks for sharing this tutorial. Nice craft! Thank you for such a cute simple to make headband. This will be a perfect project that will work with my grand-daughter’s little dresses I pick up for her. Thanks for sharing this very simple and nice tutorial! I’d like to learn how crochet as seen in my grandmother. I’m excited to do this and make one for my daughters.